Following the 1990 season, the 49ers left team stalwarts Roger Craig and Ronnie Lott unprotected and allowed them go to the Los Angeles Raiders via Plan B free agency. 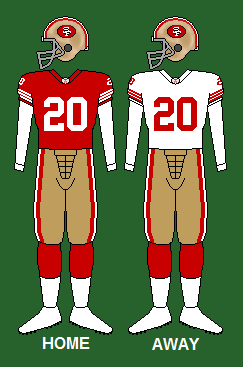 In 1991, the 49ers announced a prototype for a new logo and helmet design. Instead of the traditional "SF" oval, this new logo featured a stylized "49ers" in white with black and red shadows. However, fan reaction was so overwhelmingly negative that the idea was scrapped the next day. The only change to the uniform would be the switching from red socks with three white stripes to plain solid red socks. With Joe Montana out for the season with an elbow injury, Steve Young became the starting quarterback. The season opener, a rematch of the previous year's NFC Championship with the New York Giants, was the first loss suffered by the 49ers in a road game in nearly 3 years, snapping a still NFL record 18 consecutive regular season road game victories spanning the 1988–90 seasons. The first month of the season saw the team inconsistent with alternating home wins and road losses. In week 10 against the Atlanta Falcons, Young suffered a knee injury, causing him to miss five games. With Young out and with the 49ers record at 4–5, Steve Bono led the 49ers to five wins in 6 games. However, Young returned for the final game; a 52–14 victory over the Chicago Bears. Although the 49ers finished the regular season at 10–6, they missed the playoffs for the first time since 1982 (losing on a tie-breaker to the Atlanta Falcons due to having lost both meetings). Young would however win the first of six passing titles. ↑ Haberek, Ben (2003-05-18). "Helmets, Helmets, Helmets". Archived from the original on 11 November 2006. Retrieved 2006-11-12. This helmet was introduced in 1991 when Carmen Policy became team president. It was so thoroughly rejected by the public that the team abandoned the change 24 hours later.